Financial literacy is understanding how money works: how you make, manage, invest and expend it. A popular term swamping the internet is “Financial Literacy”. With millennials coming into their own, being financially literate is of paramount importance. It encompasses a wide variety of scenarios from balancing a chequebook and understanding personal tax to make personal budgets and analysing investment options and market trends. Globally conducted studies by the Organisation for Economic Cooperation and Development (OECD) show an alarming rate of financial illiteracy. Consumers fail to answer simple financial questionnaires the world over. They also show an inadequate understanding of financial principles, risks, and debt. Not only developing countries like India, Brazil, and China but also the first-world countries also show a worrying trend of financial illiteracy. A plethora of credit options which increases debt risks if not managed. Knowledge is key to all ventures. Nothing works better than reading when it comes to financial literacy. Once you are comfortable with the basics, you can move on the economic magazines and newspapers like “The Economist”, “The Wall Street Journal”, “The Mint”, “The Economic Times” etc. There’s also a wealth of information available on the internet. “Investopedia” provides great articles for every type of investor. There are plenty of finance-oriented blogs which can keep you updated on all things financial. Linking a financial management tool to your personal account is a great way to improve financial literacy. There are popular apps like “Mint”, “You Need a Budget” that help you manage your personal finances. They also provide access to financial literacy classes, tutorials and provide smart tips. Some apps like “Budget Simple” dole out a complete budget package tailored to your needs and help you schedule payments and investments so you can stop living paycheck to paycheck. 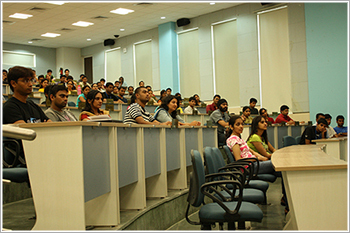 Customers with financial institutions can avail in-house services to get the basics straight. Financial organizations have full-time staff to help share their expertise and set you on the right track. Many agencies offer professional financial advice for a fee. They help you make budgets, manage debt and plan for future security. The RBI has advised bank-operated Financial Literacy Centres (FLC’s) to conduct special camps to address the dismal condition of financial literacy in India. These will be held until April 2018 at the very least and will touch base on some critical topics in financial literacy, viz. 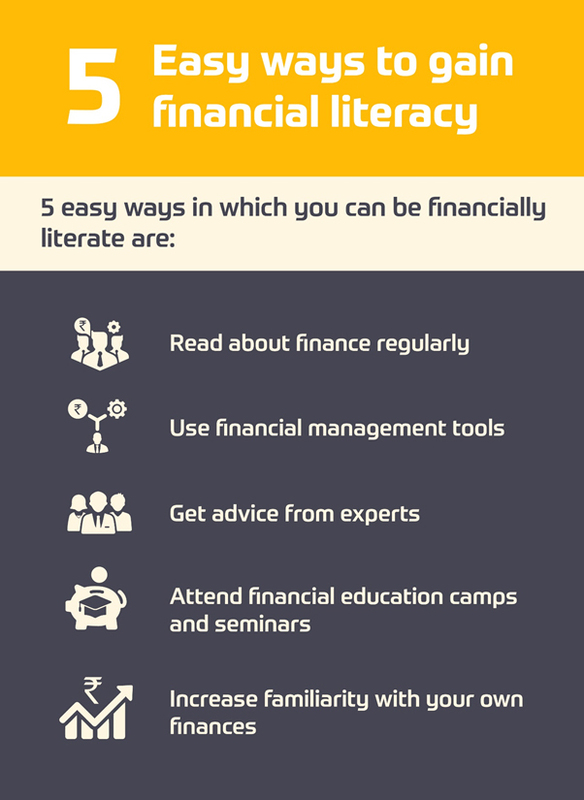 Interactive methods such as posters and handouts in local languages, online quizzes, and face-to-face sessions will be used to increase participation and interest in financial literacy. No amount of reading, lectures or apps are going to help if you don’t put your learning to practical use. The best way to ensure that is to go over your own finances and try and implement the tips learned. Financial literacy depends on mindset and habits as much as theory, thus it is imperative to make your own budgets, manage debts and plan for the future. As they say, an ounce of practice is worth a ton of talk. Financial literacy helps you make balanced decisions. Being aware if basic financial tenets help avoid bad investments, high debt, and accumulate wealth. So, be financially literate and secure your future.